IR Infra Red & Wired Remote Combo Cable for Canon, Nikon cameras. Promotional codes and special offers - please note that if you have a promotional/offer/discount code it MUST be entered in the 'promotional code' box on the checkout page at the point of order, and any offer applicable will then show in your shopping cart. Discounts or free items CANNOT be shipped or applied after your order is placed and 'checked out'. Thank you for your understanding. With this newly designed combo remote you can freely switch between the cordless IR (Infra Red) system or the cable system to meet your requirements in a variety of shooting environments. Either in front of the camera with the IR or cable or behind it with the cable, you can always feel confident the camera will shoot. A great gadget to help eliminate the chances of camera shake, and also allows you to ensure you (and your shadow!) can be well out of shot when taking a series of images for a panorama. power supply: Requires one cr2032 (3v) lithium 'button' battery - NOT included. FINAL REDUCTIONS ON REMAINING STOCK ONLY - WHY NOT ADD ONE TO YOUR ORDER! INFRA RED AND WIRED REMOTE - THE BEST OF BOTH WORLDS IN ONE REMOTE! Add to Cart - Remote Shutter Cable model RDCR2N for camera models listed above. D5100, D7000, D5000, D90 (with IR & Cord Mode); (i.e. cameras compatible with nikon ML-L3 IR control & MC-DC2 remote cord). THIS MODEL SOLD OUT - SORRY! (i.e. cameras compatible with Canon RC1, RC5 IR remote and RS-80N3 remote cord such as EOS-1V/1VHS, EOS-3, EOS-D2000, D30, D60, 1D, 1Ds, EOS-1D Mark II,III, EOS-1Ds Mark II,III, EOS-10D, 20D, 30D,40D, 50D, 5D). (i.e. 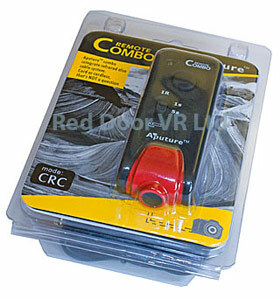 cameras compatible with canon RC1, RC5 IR remote & RS-60E3 remote cord).